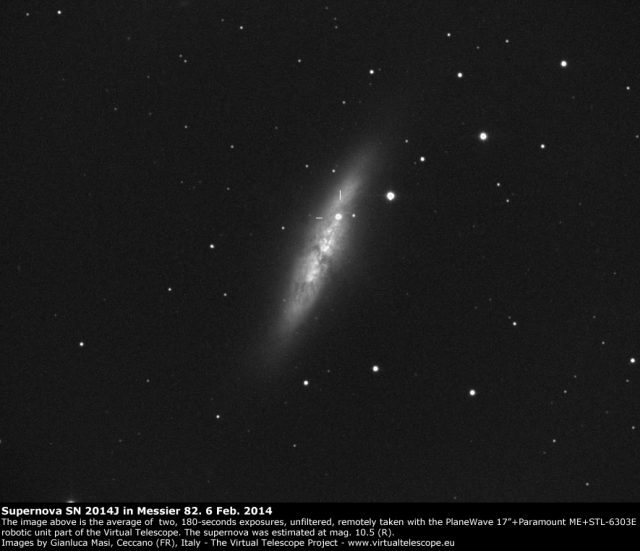 The Virtual Telescope visited Messier 82 and its supernova SN 2014J again on 06 Feb. 2014, after the luminosity peak recorded a a couple of days before. Above is an image, remotely taken with the PlaneWave 17″ robotic unit: the supernova was found at mag. 10.5, a bit fainter than 4 Feb., the date of the previous observations from Virtual Telescope. .